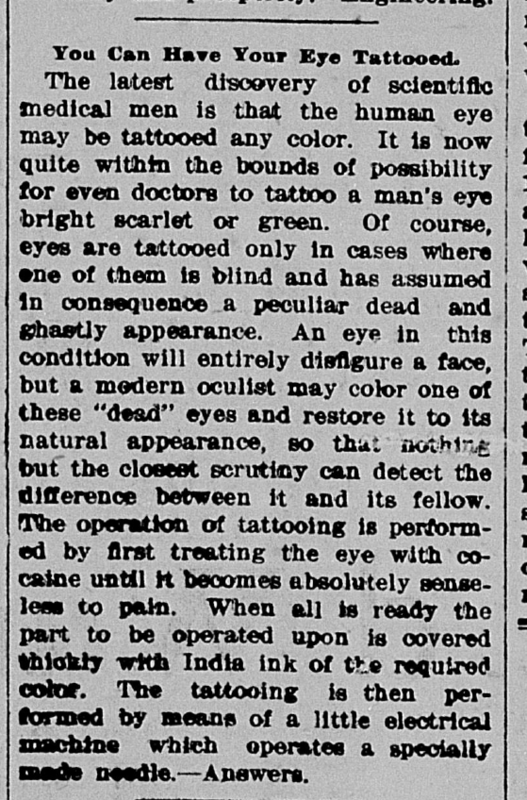 By 1884, Indianapolis newspapers were reporting on the success of eye surgeries and procedures, including tattooing the cornea, by using a brand new anesthetic… cocaine. According to A. Grzybowki’s 2008 article “Cocaine and the Eye: A Historical Overview,” doctors had been experimenting with coca leaves in Europe since the 15th century. 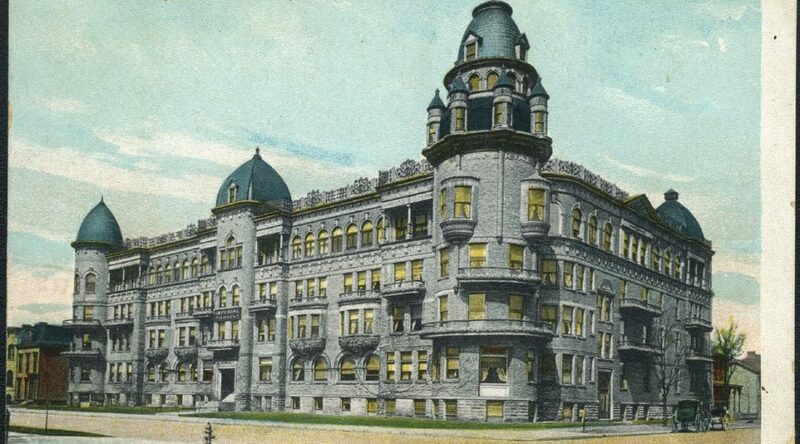 However, it wasn’t until the 19th century that they learned to extract the active component: cocaine. 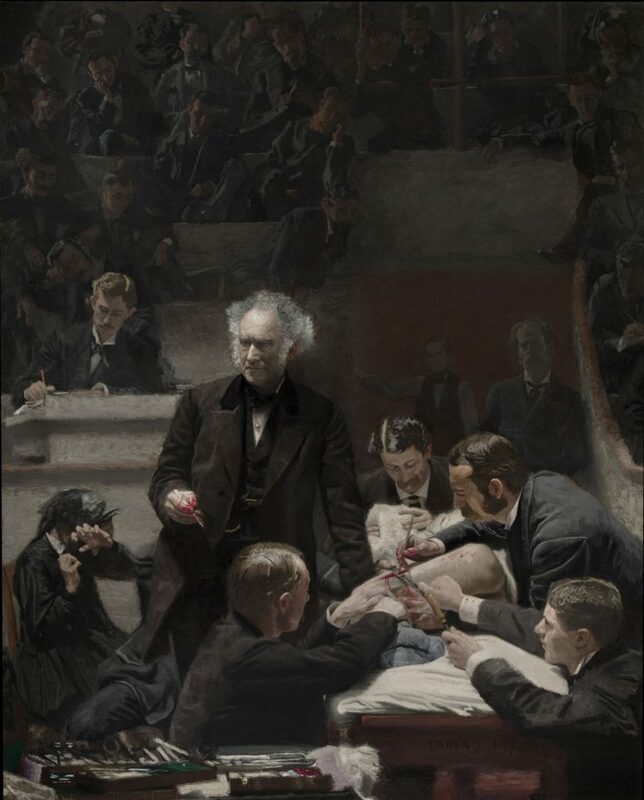 Early studies focused on the “many physiological and pathological effects,” as opposed to any numbing effects. 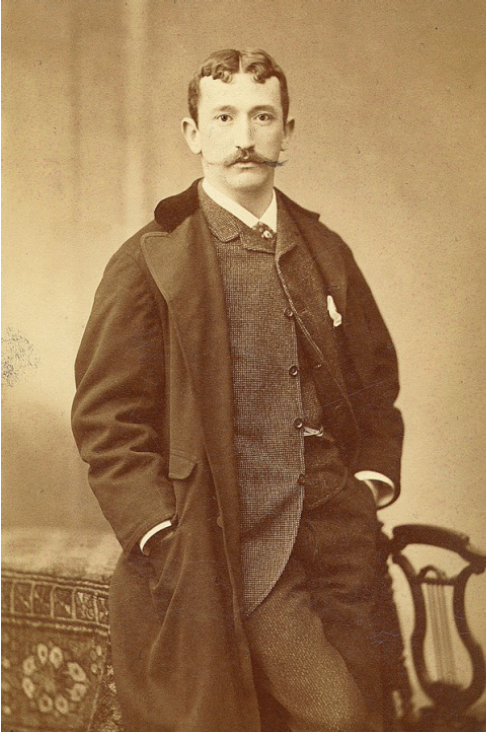 An Austrian ophthalmologist named Carl Koller is credited with discovering the effective use of cocaine as a local anesthetic for eye surgery in 1884. 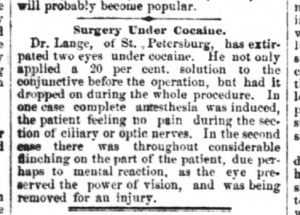 Koller found that a cocaine solution applied to the cornea left the eye temporarily unable to move or feel pain. Before this discovery, it was almost impossible to operate on the eye because of its involuntary movements. His findings, published on September 18, 1884, were widely accepted and reproduced in the United States. 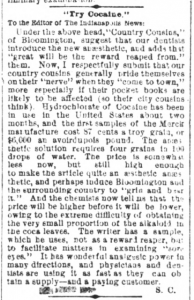 Newspapers throughout the Midwest began reporting on the wonder drug almost immediately. In fact, the first articles we found in searching Hoosier State Chronicles date to only one month after Koller’s discovery. The rising popularity of the drug was apparently driving up the cost. 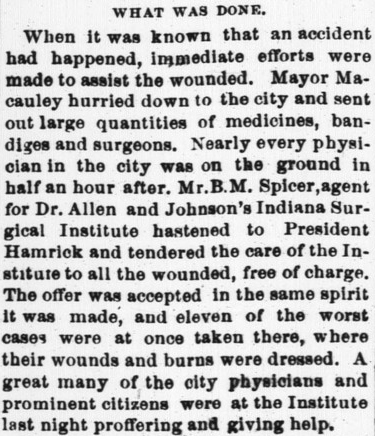 Indianapolis News, October 24, 1884, 2, Hoosier State Chronicles. 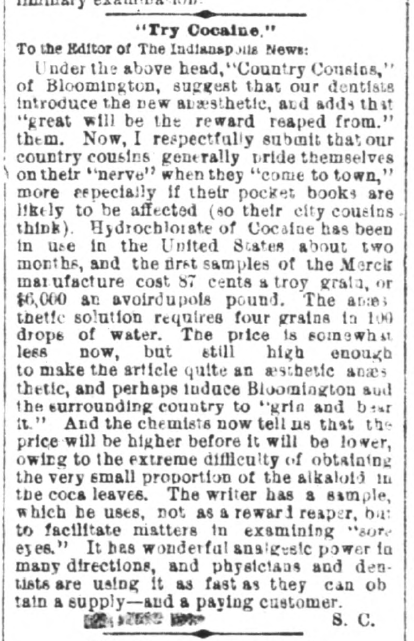 The following month, the Daily Wabash Express noted that 18 karat gold cost about $16 an ounce while cocaine cost $224 an ounce. 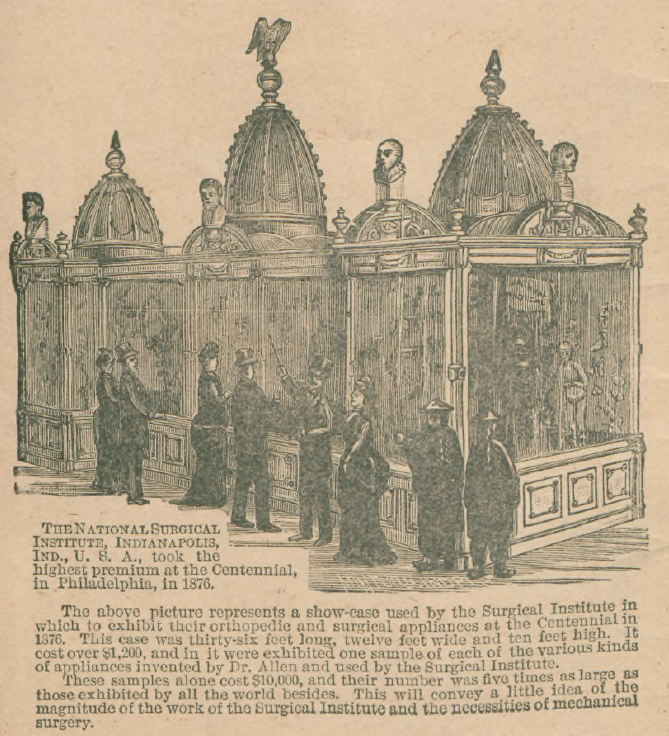 [Terre Haute] Daily Wabash Express, November 30, 1884, 2, Hoosier State Chronicles. 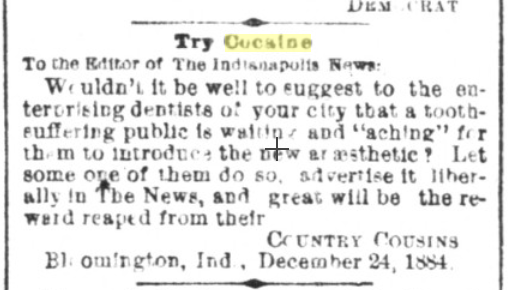 In December 1884, a Bloomington dentist wrote a letter to the editor of the Indianapolis News encouraging his Indianapolis colleagues that they advertise their use of the new anesthetic in an article titled “Try Cocaine.” This tongue-in-cheek letter is referencing the high price of cocaine. 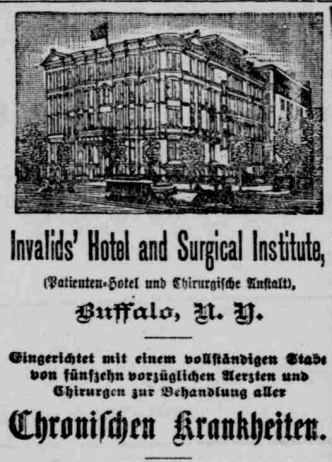 Thus, he jokes that if the city doctors advertise this expensive service, “great will be the reward reaped from their country cousins,” as most people would rather deal with the physical pain and the cost. 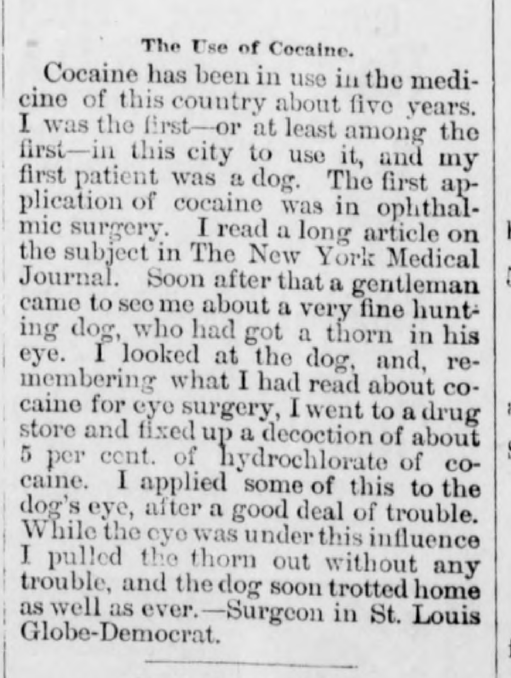 S.C., “Try Cocaine,” Indianapolis News, December 26, 1884, 4, Hoosier State Chronicles. Antonio Baratti, engraving, 1772, National Library of Medicine, accessed U.S. National Library of Medicine Digital Collections. 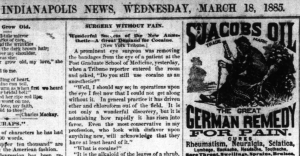 “Surgery without Pain,” Indianapolis News, March 18, 1885, 2, Hoosier State Chronicles. 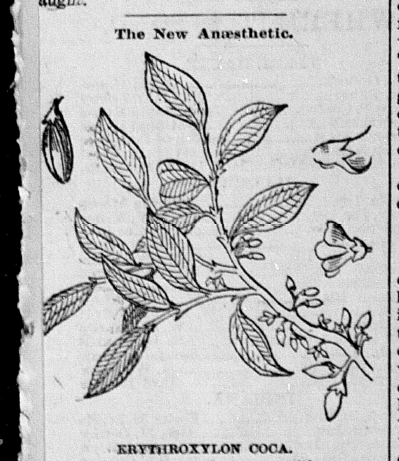 “The New Anaesthetic,” [Terre Haute] Saturday Evening Mail, February 21, 1885, 8, Hoosier State Chronicles. 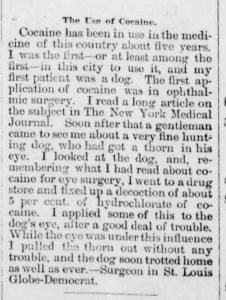 On February 21, 1885, the [Terre Haute] Saturday Evening Mail ran an article detailing the history and medical uses for cocaine, including eye surgery. 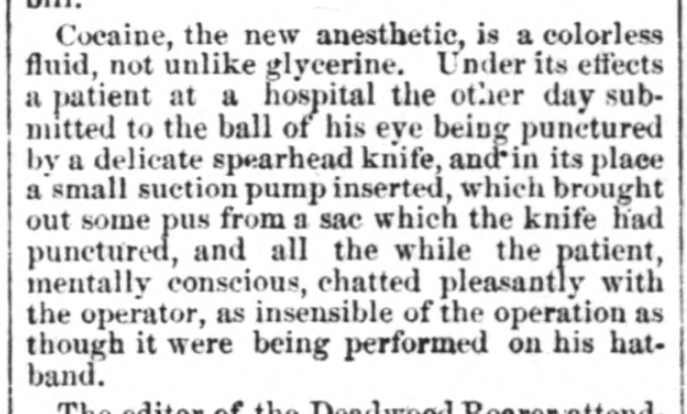 By dropping a cocaine solution “2 to 20 percent” the eye was made insensitive “and the most trying operations may thus be performed . . . without pain.” The article also contained a deadly-sounding recipe for a crystallized version of the drug that not only used ether, but also lead. 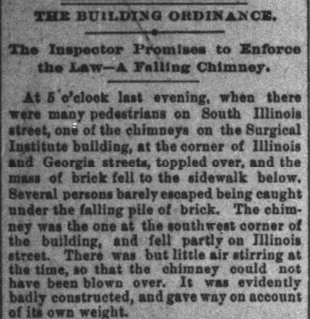 Indianapolis News, April 15, 1885, 2, Hoosier State Chronicles. 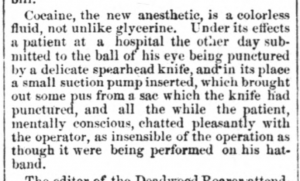 On April 15, 1885, the Indianapolis News also reported on “Cocaine, the new anesthetic” and how a patient not only “submitted to the ball of his eye being punctured by a delicate spearhead knife,” but also “chatted pleasantly with the operator” during the surgery. 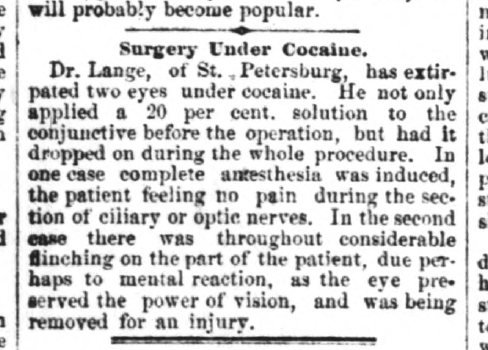 “Surgery Under Cocaine,” Indianapolis News, June 2, 1885, 2, Hoosier State Chronicles. 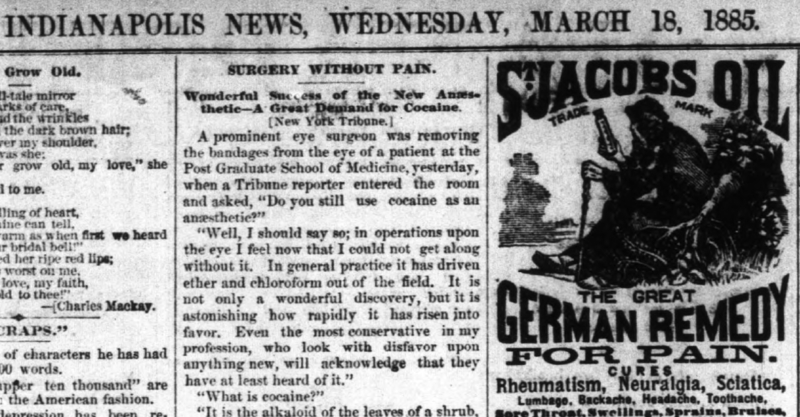 One June 2, 1885, the Indianapolis News ran a story claiming a patient felt “no pain during the section of ciliary or optic nerves” when a 20% cocaine solution was applied before the operation and dropped on the eye throughout. 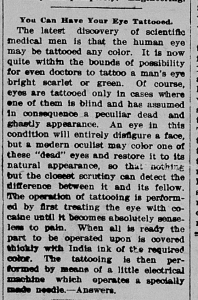 Crawfordsville Review, December 11, 1897, 5, Hoosier State Chronicles. Indianapolis News, February 10, 1900, 6, Hoosier State Chronicles. The following year that this very procedure was successfully performed by a surgeon at the nearby Miami Medical College in Ohio. 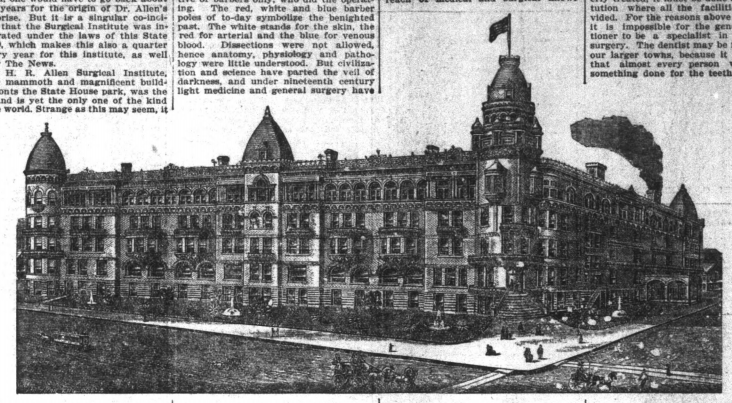 The Indianapolis News reported, “Miss Ada Duhrens . 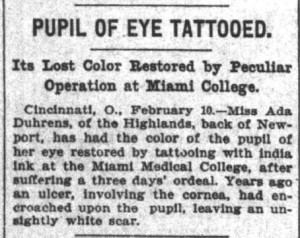 . . has had the color of the pupil of her eye restored by tattooing with india ink.” We can only assume she has cocaine to thank for the “lost color restored” in her eyes. 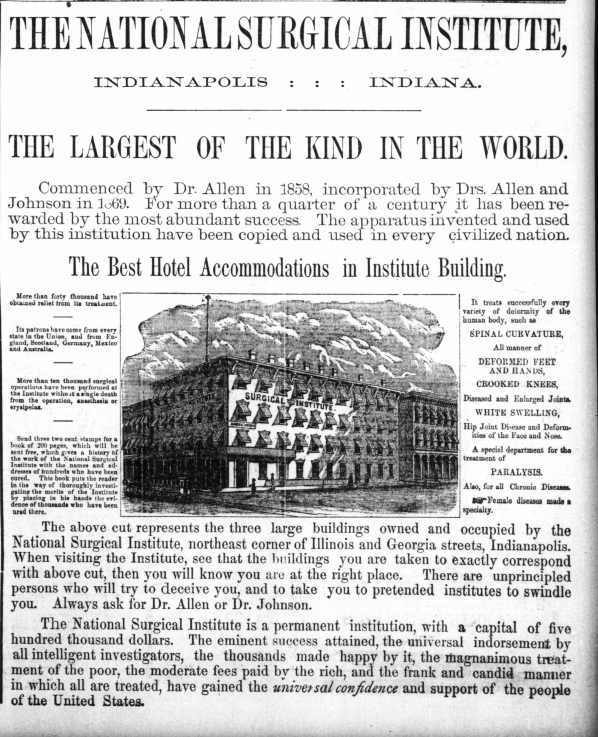 Advertisement, Terre Haute Saturday Evening Mail, October 31, 1885, 3, Hoosier State Chronicles. By this time, cocaine was also being used as an anesthetic for nose, throat, and for dental procedures. It was completely unregulated. Anyone could walk into a pharmacy and purchase cocaine powder or tablets. It was also the main ingredient in many “stimulating tonics” designed to combat fatigue and even soothe kids’ tooth aches. 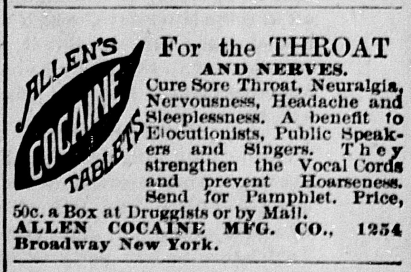 Ads appear throughout Indiana newspapers in the 1880s promoting it as a cure for hay fever, hair loss, and recommending cocaine lozenges as essential for speakers and singers. Later, it turned out, there were some complications with the wonder drug. 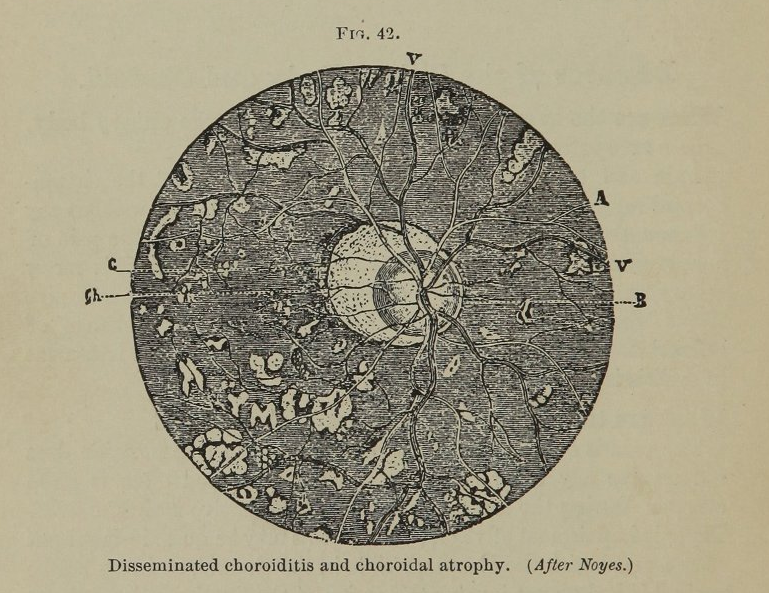 Edward Jackson, Essentials of Refraction and the Diseases of the Eye (Philadelphis: W. B. Sanders, 1890), 136, accessed U.S. National Library of Medicine Digital Collections.